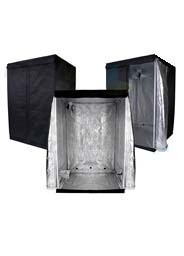 A range of grow tents designed for indoor hydroponics available in various shapes and sizes including standard, roof and heavy duty. They're easy to assemble and take down, feature hanging bars for grow lights, fans and filters, as well as ventilation socks for ducting and power cables. 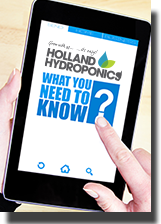 At Holland Hydroponics we stock leading brands including BAY6, Secret Jardin, Silverback, Grocell, HomeBox and Mammoth by Gavita. Mammoth Classic grow tents are manufactured with a highly reflective material that ensures the light is spread evenly inside the tent. This heavy duty, stylish and practical Heavy Duty Silverback Grow Tent has a strong design, capable of satisfying everything you wish for your indoor growing environment. It has strong 19mm steel poles and metal fixing to give it a sturdy frame. Great quality Silverback Roof Tents. Grocell Propagation Tents, ideal for rooting clones, germinating seeds or keeping a mother plant alive. Developed to be used with low energy lights, T5, CFL & LED's, they're available in 3 different sizes. The Secret Jardin Darkroom 2.50 comes in a range of sizes, making it easy to find a tent that matches your growing needs. These grow tents each have a robust structure, various well-positioned ventilation and cable holes, depending on tent model, and easy access panels to make looking after your plants easier.